In the gigantic world of videogames, there is a little known subculture of “classic gamers”- that is, the first generation of arcade games that we of the 30-something generation grew up with – Pac Man, Asteroids, Galaga, and Donkey Kong. In “King of Kong: A Fistful of Quarters” director Seth Gordon digs deep into the world of classic gaming and discovers a highly competitive underworld of obsessed supergeeks who cling onto these once-thought obsolete games. 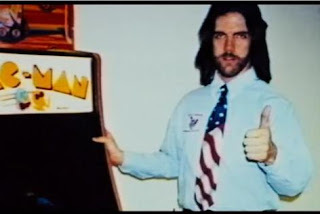 The ‘king’ of “King of Kong” is Billy Mitchell, a supergeek from the 80’s who's still the reigning champion of Donkey Kong – remember that simple game featuring Mario jumping over barrels trying to rescue his wife from a giant ape? Well, apparently the game is not so simple. According to these gamers, it’s the most difficult of the classic games and the toughest nut to crack. Billy Mitchell cracked it in 1982 and became a 15min-fame superstar, appearing on a cover of Life Magazine. It's now 25 years later and Mitchell clings to his title like a life preserver of minor celebrity. He is the king of a clique of geeks who keep alive a competitive record-keeping society called “Twin Galaxies”. But when Steve Wiebe, a humble middle-class father from the Seattle suburbs, suddenly breaks Mitchell’s record a rivalry of operatic proportions ensues. “King of Kong” is a great documentary because it does what documentaries do best, put a microscope to an obscure subculture of society and finds relatable goals, emotions, and characters. I have an affinity to the material, being a first generation gamer, and so I found fascinating the intricate details of the “Donkey Kong” game. The gaming experts breakdown the strategy of this seemingly ‘simple’ game and accurately explain to us the skills involved in achieving the high scores Steve and Billy compete for. Gordon uncovers a sport as exciting and competitive as say tennis or golf. For regular folk it’s the cast of characters that make the film great. It’s easy to see why the gaming clique would feel threatened by Steve Wiebe – he’s of the same generation as the “Twin Galaxy” gamers, but he’s good looking, athletic, the perfect American family. Wiebe’s backstory explains a lot about the psyche of this insular world. Steve grew up almost succeeding at many things, basketball, baseball, etc. But he never became the best at anything. Arbitrarily Wiebe chooses Donkey Kong to master. Donkey Kong becomes his benchmark for success in life. For Billy Mitchell, he already is at the top of the food chain. He has nowhere else to go but down, and it’s fascinating to watch how he his minor success has fed the remainder of his life. He parades around a buxom wife; wears a ridiculous coif of feathered black hair, and sports a series of America flag ties. Yet with all his posturing the fear of losing prevents him from a face-to-face confrontation with Steve. Gordon’s cinematic accoutrements add wonderful nostalgic detail. His soundtrack includes corny 80’s pump-up rock tunes like “You’re the Best” by Joe Esposito (you know, the montage scene from “Karate Kid”) and his pixellated freeze frames and 80’s-chic stylings all add to the film’s geek-hipness. The film builds to a climax which doesn’t depend on a mono-a-mono confrontation. By the end you will believe so hard in the honesty of the characters. Specifically Steve Wiebe who becomes a beacon of light for the gamers. We want him to succeed and win so badly, but above all we want him to be accepted into the society of losers who initially rejected him. “King of Kong” is a little gem that needs to be discovered. Enjoy. “King of Kong: A Fistful of Quarters” is available Tuesday Jan 29 from Alliance Films.